Concerned about the cost to order Oki B6100 toner cartridges these days? We have a low price promise so our toner for the Oki B6100 laser printer are incredibly affordable. Not only are we very affordable on the price of Oki B6100 toners, we also place a great emphasis on cartridge quality. Now you can forget having to pay pricey high street prices because we'll offer you a cheaper option. Putting up with a poor quality Oki B6100 toner cartridge isn't a very good idea. With our no quibble money back guarantee on toners you won't have to take any chances. We'll offer you a 100% refund if your Oki B6100 cartridge isn't able to meet perform dependably. Get your order in now from Cartridge Save and save money. This feature-packed monochrome laser printer is aimed at high volume users. The Oki B6100 A4 mono laser printer features high capacity paper handling and reduced printing costs, while the fast print speeds ensure less downtime and improved productivity. 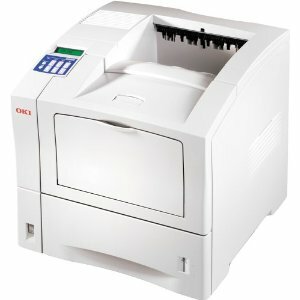 However, the Oki B6100 laser printer is rather expensive and lacking in some essential functions. The almost box-shaped frame that measures 17.3 inches tall, 16.3 inches deep, and 16.6 inches wide makes the Oki B6100 LED printer easier to set-up on an office desk. It weighs 25.6Kg and runs on 64MB of standard RAM with a 350MHz processor. USB connectivity is the main interface of the Oki B-6100 printer, while standard paper handling is via a 550-sheet tray and a 100-sheet manual feed slot. The control panel includes a small display screen and a few buttons for one-touch operation and menu navigation. With options, the maximum paper capacity that the Oki B6100 black and white laser printer can handle is 1,750 sheets. The memory is upgradeable to 256MB. The print speed is up to 26ppm, and while it is fast, it doesn't compromise the quality of output because of the high 1200x1200dpi resolution. The Oki B6100 monochrome laser printer is capable of automatically detecting paper size. Featuring a combined toner and drum, the black Oki B6100 print cartridge is the only consumable for this printer which takes the hassle out of maintaining it. The B6100 laser printer does not have built-in Ethernet, so it can be difficult to share in a workgroup. Compatibility issues are common in computers running higher versions of Windows and Mac. The Oki B6100 A4 LED printer is also heavy, with limited support for speciality media. The device could be better with a larger operator panel and direct printing capabilities.